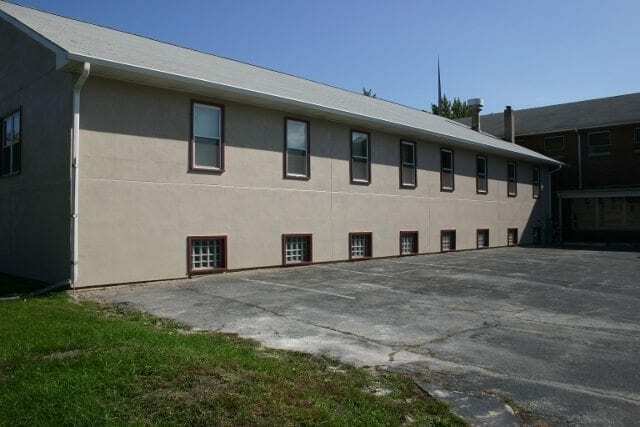 When the team at Primecoat Coating Systems of Indiana met with their new client they realized that this building had the potential for using the latest in EPS Foam Coating technology. EIFS is an Exterior Insulation and Finishing System designed to provide not only insulation but an aesthetic appeal to an existing wall system. Let’s look at this project and its application process. 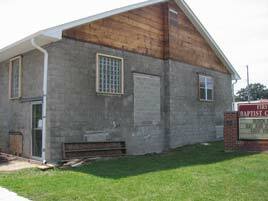 The building had masonry block walls with some wood framing. Its current situation was a fading and degrading brick exterior that needed to be removed. In addition to that, the principles of the property desired better insulation for their building. It was an easy choice to go with a vertical coating system called EIFS. The first step in the exterior wall finish was the installation of the 2″ foam panels. A crew of two installed the foam to the masonry block in 2 1/2 days. Next a crew of (5) began the scratch coat process. 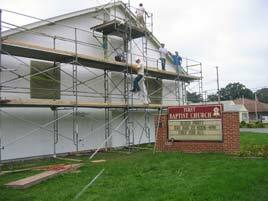 It is at this point that Primecoat Coating Systems of Indiana went with SureCrete’s WallSpray. WallSpray is an exterior concrete coating that simplifies the installation process due to its premixed formula. WallSpray is eco-friendly and increases the flexural strength of the EPS foam. With a zero VOC and a 35% post-consumer recycled content, it helps contribute toward LEED points as an exterior hybrid stucco. If that was not enough, it simplifies installation due to its single component design. The crew began with (1) premixed bag and (1) measurement of water, mixed to a lump free consistency and began spraying it on the EIFS foam panel. The installation team mentioned that they enjoyed using WallSpray as it was self-bonding and did not require the extra labor of rolling on a primer. In addition to that the scratch coat, base coat and texture coat are all the same material! They also did not have to rasp the foam to within 1/8 of an inch o f level. SureCrete’s WallSpray can be troweled up to 1″ in thickness with no bonding or strength issues to overcome dents and elevation differences in the foam. The scratch coat of WallSpray was applied with a Graco RTX 1500. This vertical coating was sprayed on until the material was to the verge of sagging. At this point one of the crew members began to trowel in the 4 oz fiberglass mesh. This process gives added structural strength to the foam and aids in decreasing and in most cases eliminating the denting of the core foam panel. Note: The manufacturer suggests that you make sure that no residue is on the panel before application. The material will stick to the residue but that residue can cause failures as it is not bonded well to the foam panel. After getting the scratch coat applied to the whole building, they began spraying the base coat. This coat gives the base aesthetic appeal of design and hides the fiberglass mesh. Although the project did not require an integral coloring system, WallSpray can be integrally colored with (1) pre-measured color pack per bag of WallSpray. The final coat was the knockdown texture. This was also sprayed on and knocked down with trowels. The last step was to provide color and the final waterproofing to the new exterior wall finish. For this they used a quality exterior paint from a local supply center.